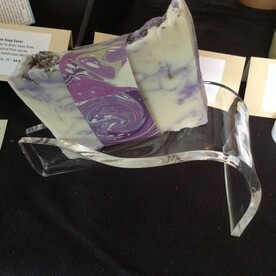 Our handmade soap retains its natural glycerin which gives you a moisturizing bar of soap but the soap must be drained between uses to make your soap last as long as possible. Each dish has been cut in a manner that allows water to drain completely through the dish and away from your soap. 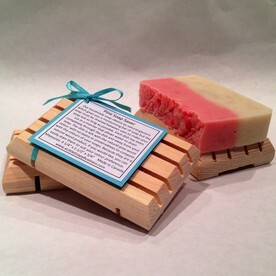 The dish is left with the natural pine wood colour with no stains or preservatives to compete with the colours of your soaps. Because they are a natural wood product, if you would like, you can easily stain them to suit your colour preference. Note: Because the ribbon is recycled, the label and ribbon colour may vary. Modern and fun design. Each dish has been designed to allow water to drain completely and away from your soap. The dish clear design won’t compete with the colours of your soaps.